When you look good and smell good, you feel good. And it all starts with getting the best wash for your clothes. That’s where Ariel Original washing powder comes in. It removes tough stains by cleaning deep down in the fibres and prevents them from setting in. It even removes the stains that cause bad smells like sweat and body odours, leaving your clothes looking and smelling brilliantly clean. It gets to work at 30°C so if you want to keep your whites bright, reach for Ariel laundry detergent. Wash your clothes again and again with confidence. For an extra boost of freshness and softness, use together with Lenor fabric conditioners and Unstoppables. 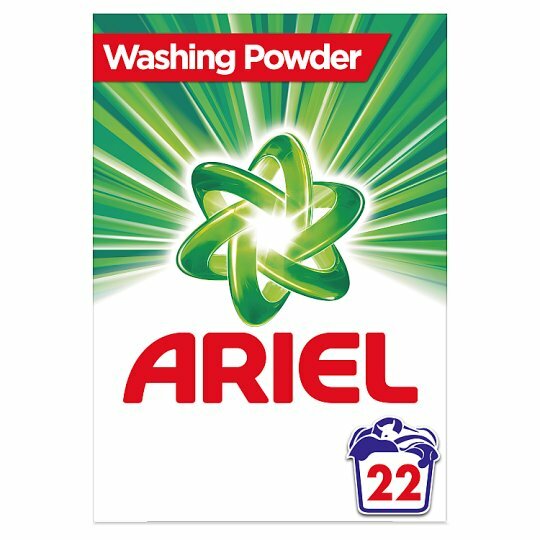 Ariel Original is also available in washing liquid & pods. 22 washes based on 65g per wash. WARNING Warning. Causes serious eye irritation. Keep out of reach of children. IF IN EYES: Rinse cautiously with water for several minutes. Remove contact lenses, if present and easy to do. Continue rinsing. If eye irritation persists: Get medical advice/attention. IF SWALLOWED: Call a POISON CENTRE/doctor if you feel unwell. If medical advice is needed, have product container or label at hand.